Tottenham midfielder Eriksen, identified as the dangerman by Australia in the run-up to the game, showed a sublime technique to finish after Nicolai Jorgensen’s neat lay-off in the area. 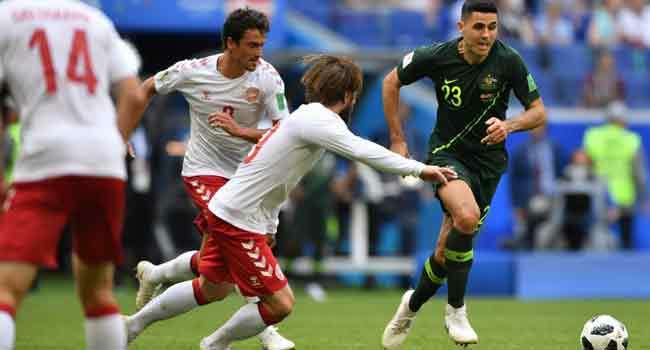 Australia’s response was impressive but with just one point from two games, the Socceroos’ chances of advancing in Russia now appear slim. The Leipzig frontman had been Denmark’s hero with the matchwinner against Peru but was adjudged to have handled the ball and the referee consulted the Video Assistant Referee system before pointing to the spot. Eriksen’s free-kick caused mayhem in the box just minutes later, with Mat Ryan collecting in relief after the ball came off the leg of Trent Sainsbury a yard from the goalline. The Socceroos were quickly into their stride after the restart, only for Pione Sisto to curl just wide of Ryan’s goal. Andrew Nabbout’s game ended prematurely when he fell and suffered what looked like a dislocated shoulder, the Urawa Reds frontman replaced by Tomi Juric.